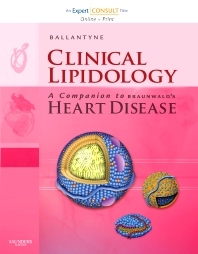 Dr. Ballantyne—one of the foremost lipid experts in the world and recruited by Dr. Braunwald’s Heart Disease editorial team—together with a stellar cast of contributors provides all of the scientific and clinical information you need to effectively manage every aspect of dyslipidemia. From basic science to pathogenesis of atherothrombotic disease to risk assessment and the latest therapy options, this new title in the Braunwald’s Heart Disease family offers unparalleled coverage and expert guidance on lipidology in a straightforward, accessible, and user-friendly style. Plus, Expert Consult functionality gives you anytime, anywhere access to the full text online. • Includes full text online access at expertconsult.com. • Features the expertise of one of the foremost experts in the field, ensuring you get authoritative guidance with the most definitive knowledge available. • Contains extensive clinically relevant information covering risk assessment, therapy, special patient populations, and experimental therapies, including targeting HDL to help you effectively manage any challenges you face. • Uses treatment algorithms for easy access to key content. • Presents current practice guidelines that assist in the decision-making process.